Kewl Design Alert: Colour Picker of the Future? If you've ever used PhotoShop, you know that there's a little eye dropper tool that you can use to pick up any colour, even if it is only present in a single pixel, and capture it. Then you can use the colour elsewhere in your design. Well, what if you could have a colour picker to use in real life? That's the idea behind the Colour Picker by Jin-sun Park. The concept is based on the RGB colour model, where Reg-Green-Blue are combined to in varying degrees to represent colours. 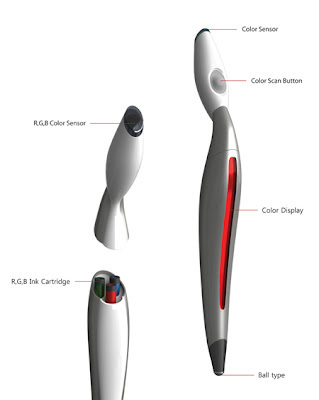 In the pen, there are 3 ink tubes (Red-Green-Blue) which are mixed in varying strengths to simulate the colour scanned. It's a perfectly brilliant idea. 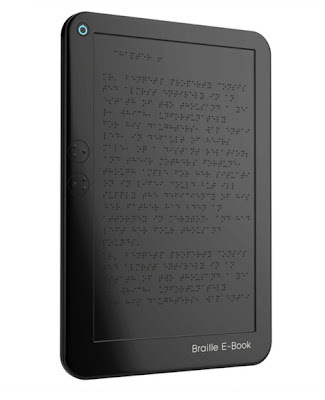 Jin-sun Park has many other amazing designs, not the least of which is a braille e-book reader. So simple. So incredibly brilliant.